My back is sore, my head is painful, my legs ache, I feel like I’m about to vomit and my feet are in pieces. It is around 2am and I am stumbling over broken glass and litter on the Medway viaduct with a Portuguese stranger who is worried that he hasn’t seen any reflective tape for a while. I have well and truly fallen down the rabbit hole. I’m sat in Zizzi’s Farnham branch tucking into bruschetta followed by Spaghetti Pomodoro in a classic carb-load double. Opposite me, Andy is having the same but with vegan cheese. 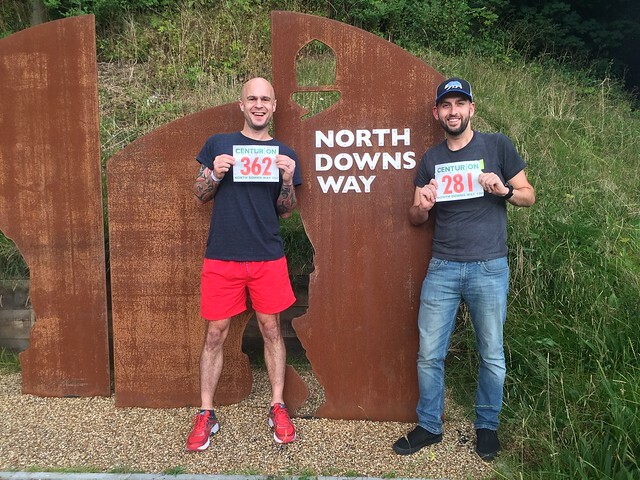 We’ve both just dropped off our bags at registration for the North Downs Way 100 organised by Centurion Running and after a couple of pictures in front of the NDW sign, were now going through last minute details. 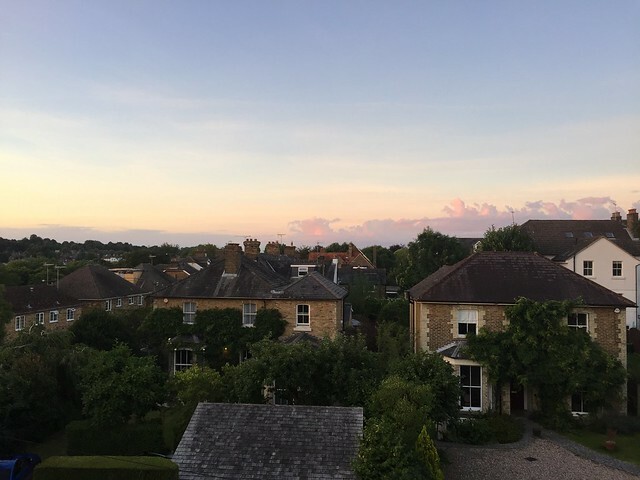 I was staying in a lovely Airbnb a stone’s throw from the beginning of the trail and Farnham railway station (a perfect location if you’re looking for a place in Farnham) which had made carrying the ridiculous amount of carb gels, Clif bars and energy food much easier. This is especially convenient as the next morning I was getting up at 4am to run 100 miles to Kent. I was more nervous of waking up late than the distance which either shows how much of a night owl I am or that I really hadn’t comprehended the challenge at hand. Either way, food finished, last minute blister plasters bought and off to bed by 8pm – a rock and roll Friday if ever there was one. Saturday morning arrived brightly through the skylights with an orange tint and I actually thought for one second about turning over, feigning injury and having a nice weekend in the ‘burbs but after 800 odd miles of training and countless money on running gear, it seemed a like a waste for a couple more hours sleep. 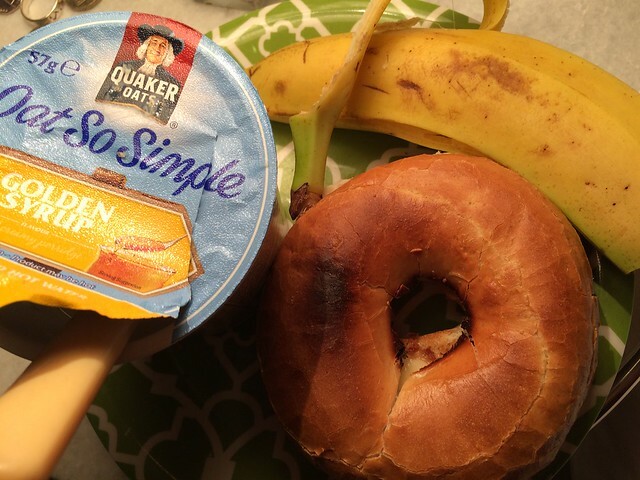 Breakfast was the usual peanut butter and banana bagel with a side order of porridge and after a bit of final pack rearrangement, I headed down the road to Polycarp’s school. I’ve never been to an ultra that I haven’t been racing in but if they are all as well organised as this, I will be a very happy man. Like a conveyor belt of brightly coloured Salomon, Inov-8 and Hokas, runners moved through bag drop, kit check, toilet break with controlled speed. On stage (we were in a school hall), the Race Director gave asked for a show of hands of those doing their first 100, those doing the grand slam (the four Centurion 100-milers in one calendar year) and those who had completed more than 10 ultras. At each stage, a collection of hands shot up. “This is to show you that no matter what level you are at, there is somebody else going through it with you,” he said. It may not seem much but it was a great way to calm last minute nerves. It was a cool, crisp morning and considering the challenge ahead, everyone seemed to be in great spirits. After the briefest of countdowns, 229 of us set off along the track and I was quickly overtaken by a number of runners. For a couple of miles, this continued and I worried that I was going out way too slowly but then it was 103 miles not a parkrun? Had I joined the wrong event in Farnham? Luckily I spotted Andy just ahead who was also getting overtaken and fell into stride next to him. He was similarly unsure about the benefits of heading out too fast. The fields were bathed in golden light but it was still not warm as we passed undulating farmland that could not have been more quintessentially English. Tractors in fields of wheat, golf courses and cricket pitches tessellated pleasantly as rolling hills with bushy green borders flowed past at steady pace. I fell in step with an Irish girl who matched and even surpassed my ultra-fandom and also started every sentence with “On this podcast” so the miles ticked over nicely as we discussed Kilian, Scott, Transvulcania and of course Western States, part of the reason we were both there (NDW100 qualifies you for the lottery). We breezed through the first aid stations where I took in a couple of cheese sandwiches. Ultrarunning is sometimes described as a picnic with bits of running and I was very happy to reinforce this image. We descended though Denbies Wine Estate and into Box Hill as the weather began to heat up so I took on more water and some grapes to takeaway. 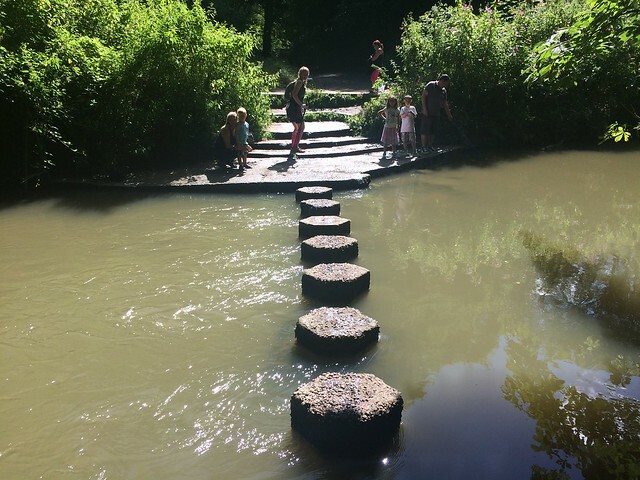 The picturesque stepping stones lay before the first brutal climb which was followed straightaway by another beast as we hit Reigate Hill. I had no real idea of my timing by this stage and was relying on Donna who assured me we were well within cutoff, while Andy had pushed on to try and get the magic sub 24 medal. 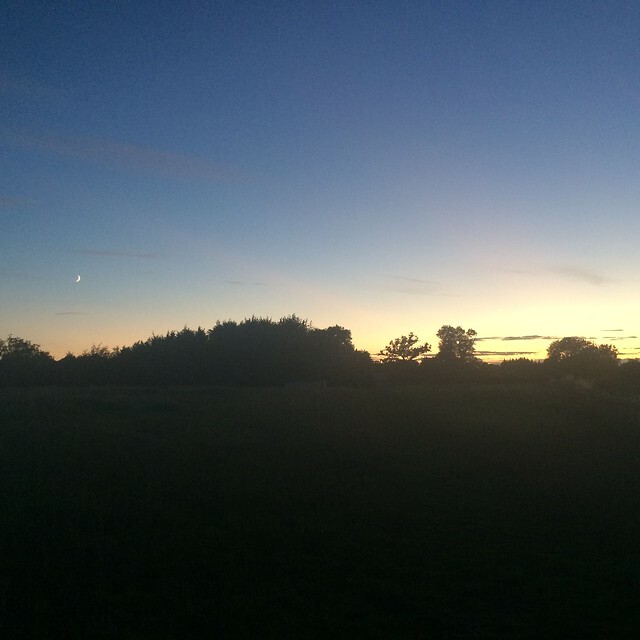 Part of the reason I wasn’t sure about my pacing was because I was enjoying my time in the countryside and feeling strong with no niggles or aches. At Botley Hill I got to enjoy some of Magpie Bakes famous treats, plus more fruit and water before pushing on for halfway at Knockholt Pound. My novice crew of Rick, Jake, Toby and Amy (dad, brothers and brother’s girlfriend) had already popped up on the course where I’d taken bits and pieces of food but at halfway they had their work cut out helping me change clothes and get food. The problem was, I wasn’t hungry. There were tables full of food in addition to the shoebox full I had prepared but although I needed to keep eating I couldn’t stomach anything. I was also faffing with everything and Donna’s boyfriend came over to tell us that 25 minutes had passed. That might not sound like a lot but all the time spent at aid stations is time not moving. I ate some more hula hoops then headed back out again with Donna but we also each now had a pacer (I borrowed one of hers). We settled back into a brisk walk but something was wrong. Donna was feeling sick so the four of us slowed to a walk. Then stopped briefly. Then ran for a bit before walking. Nothing was shifting her nausea. I’d be lying if I wasn’t selfishly thinking about my own race at this point. I wanted to help but there was nothing I could do apart from meekly ask “Are you alright?” Our pacers were more understanding and importantly, less awkward with Donna so I just kept out of the way, although it was hard not to be a bit bored as the path had now turned into dull roads, an M25 crossing and middling villages of no real features. A few miles down the road, we decided to part company with “my” pacer Dorothy would accompany me to the next checkpoint. Having a new person alongside me for 10 miles or so was a brilliant distraction from the average surroundings and increasingly sore feet as we meandered towards 60 miles. The sun was beginning to set and the sky behind us was bright pink with purple tinges and a crescent moon over the hills. The temperature had also dropped so we ran where we could, trying to make up some time from the walking earlier. 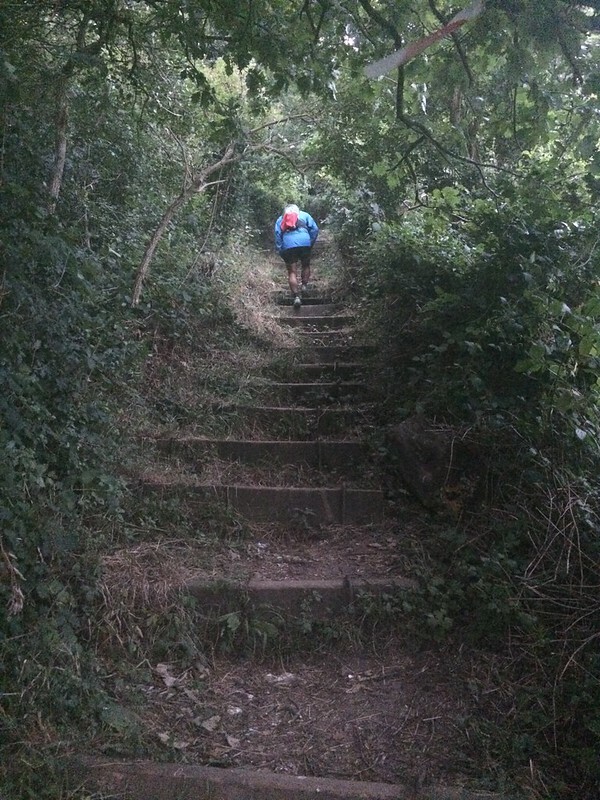 With a few miles to go until CP8, it was so dark in the wooded areas that I had to get out my headtorch while Dorothy ran with the light of her phone and further down the hill, more headtorches bobbed along, reassuring us that we were on the right path. 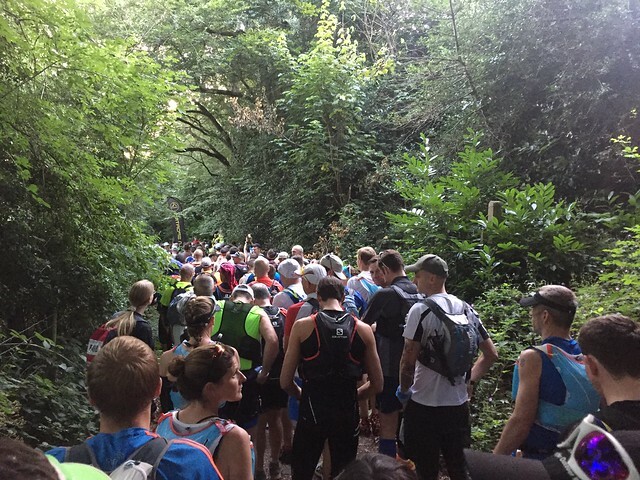 Annoyingly, I spotted the same headtorches a couple of miles later mistaking them for the next checkpoint at Wrotham. Although it was now very dark, I probably should’ve been able to distinguish between two female runners and an actual tent. Night running was going to be interesting. He wasn’t. Three hours of vomiting had resulted in him DNFing. It goes to show how even the best preparation can still not be enough for the strain of an ultra. With Donna an unknown distance behind me, I was faced with nearly 8 hours of darkness running so as I saw a runner leave, I quickly got ready and my dad shoved a Marks and Spencer’s Cheese and Onion Roll in my hand. The taste of something savoury was like Red Bull mixed with rocket fuel and I hared off down the road to catch up. Once I’d caught him, I felt so good that I kept on pushing my pace, extending the distance between us. I felt like I could up the pace and get the rest of the distance done then and there. But pragmatism caught up with me when I arrived at a gate and I remembered that if I left this guy, I would be stuck on my own in the middle of Kent having already run 6o miles. I stayed with him even though he was walking and chatted for a while, after all walking was still going to get me into the finish on time at this stage. And that’s how it continued til the next aid station where he decided to call it a day. I again had to run to catch up with the next runner and this time I was troubled by most recent partners’ withdrawal. Admittedly it was late, we still well over a marathon to complete and he had already run further than he had ever done before but just to drop so easily made me scared about how I might be. All the way into the aid station he had seemed relatively happy and we were making good pace but he had chucked in the towel. You never know what it going on with another runner’s mind or body but as I caught up with the headtorch in front of me, I vowed not to do the same. Rui was man 20 years my senior with ultra experience to match. He was also unusual that he did not use a GPS but kept his pacing with a combination of watch and checkpoints. As I caught up to him, he was also surprised that other runner had not continued but also said that we needed to run a bit to make the next station in time. Having lost all idea of my timing and piggybacked on Donna’s strategy before, I was very happy to blindly follow his lead and we began to run. The terrain in the 2nd half was much less hilly and allowed plenty of running if you had the energy. The flinty surface underfoot was hard work on sore souls but we made good progress through open fields with the lights of civilisation turning the night sky orange to our right. Again I felt like my legs had the energy to run but didn’t want to strike out on my own. Also, my feet felt painful in all the wrong places. No blisters but sore all over. The lowest point of my whole run started at the Medway crossing. After miles of countryside, the concrete was jarring and ugly in comparison. The bridge was strewn with litter and there were signs for the Samaritan’s hotline. It is exactly scenes like this that got me pining for an escape to the country in the first place. By this point I was so tired that I was beginning to weave across the trail as we climbed Bluebell Hill to the next aid station. I even fell into microsleeps while walking, waking up seconds later on the other side of the path. I was seeing things in the bushes. Not normal things though. I saw a blue Indian God relaxing in the grass to my right and a rhino looking at me from the field on the left. I needed to rest, I needed to sleep. Just 15 minutes in the back of my dad’s car would sort this out and I would bound through the rest of the race fully recovered. Not if Rui had anything to do with it. “Don’t sit down. Just carry on”, he said. I complained to anyone that would listen at the aid station that this guy wouldn’t let me rest but he was right. We pressed on, keeping to his watch and importantly, keeping within cutoff. We were now almost entirely silent. Pleasantries are out of the question at 4am when you’re both in pain. But we kept walking then running and shuffling then walking through the night until the sun came up. It wasn’t even the epic sunrise I was hoping for, that would somehow instil magical solar energy within me. Instead a grey haze surpressed the sunlight, reflecting the difference in mood from the bright enthusiasm of the previous day. A masochistic series of steps after Detling nor a Bull-in-path-protecting-calf situation a few miles later were not enough to stop us, the end was in sight. I decided to go for a final push, leaving Rui and for the first time in over 24 hours, having some time on my own. It was nervy to not have the backup with me but I kept running, desperate not to be anywhere close to the cutoff time and then I was told I had just seven miles to cover and nearly three hours to complete them. I began crying with the realisation that I was going to make it. I thought about how long I’d talked about running 100 miles, how much I’d trained to get to this point, how much I’d changed, I thought about my grandma and how many people had supported me to get to this point. Then I realised there would be photographers at the finish line and in the words of The Cure, Boys Don’t Cry. I ran into Ashford, catching another runner who was clearly struggling so I stopped to walk and talk. By this point, the top of my left foot was excruciating and the outside of my right was equally painful.We were overtaken by some familiar faces including Rui but I knew we had enough time to make it to the stadium so carried on walking. With half a mile to go, I started my final run. As I approached the rail bridge, my dad, as he had done all night, came out to meet me and guide me home. I crossed the road, turned into the stadium, heard cheers and knew it was nearly done. I always think about the finish line. Like constantly. From the point I enter a race I visualise how I’ll feel when I cross it and what I’ll do coming into the line. This time, I heard shouts of “SPRINT FINISH” and tried my best to oblige, crossing the line with an aeroplane celebration. I was given my prestigious 100 miles belt buckle, then saw my family and my friend Gosia who had managed to make it, immediately realising it was her who had shouted for the finish (it was something I always told her to do at parkrun). The finish area was like a scene from Platoon, with casualties strewn across the floor and absent looks on the faces of the runners. I honestly can’t describe my emotions at the time but somewhere between happiness and relief is probably about right hence the lack of smile on my face – I was happy on the inside. I was even happier that Rui finished (ahead of me) and that Donna made it with 15 minutes to spare. My feet were swollen and my back ached but, considering I’d run half the width of the country, I was feeling pretty damn good. I’ve run 100 miles. I’ve done it. But I’d only crossed the line thanks to the incredible people I am fortunate enough to have in my life. Victoria for the countless hours she puts up with my running. For sterling work as crew: Rick, Jake and Toby (plus great PB&J sandwiches from Amy). To Gosia for actually finding the right place, Dorothy for being my surprise pacer and Donna and Rui who let me tag along with them over a combined 100 miles. Huge thanks to the volunteers and organisers who kept me going over hills and through the night, thank you for giving up your time for this ludicrous folly. I hope to cheer you on at something equally ridiculous soon! Now for Western States…who wants to crew in California??? 100 miles is not that far! Entering my next one tomorrow…fancy it? Incredible, amazing, but absolutely bonkers. Congratulations! Thank you for this amazing story. Did they provide runners with gels like High5 and protein drinks? How was the path marked? Was it easy to find a trail? Planning to run it this year. Hi! 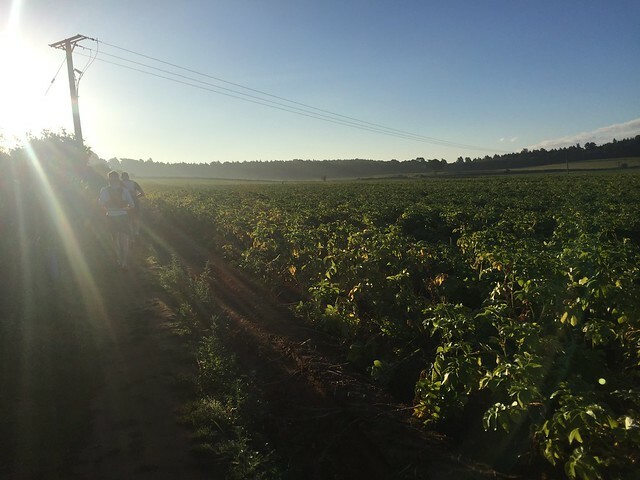 From what I remember, there were some gels at each aid station (GU sponsor Centurion events) but it was mainly “real food” – crisps, sandwiches, fruit, cake and chocolate etc. In terms of path markings, Centurion are very good at marking the route with tape and reflective tape for the night. No problems following the course at all. Best of luck with your training! !